Gautam Gambhir widely known for his cricketing feats across the country revealed his passion for motorcycles and met with fellow motorcyclists of the city. Gautam Gambhir felicitated KTM riders who have won major Indian rallies over the past one year. 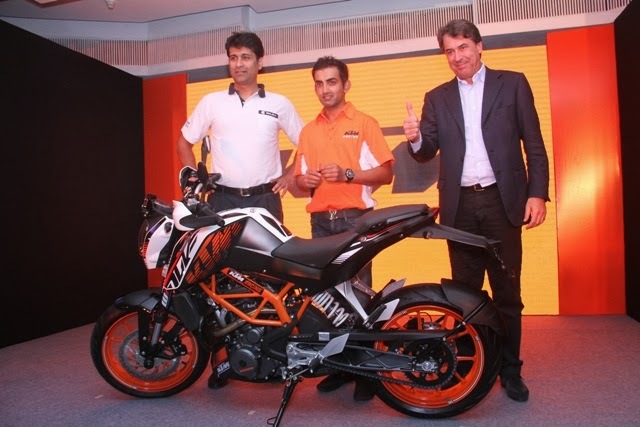 Gautam Gambhir was himself presented with a ‘Special Edition’ KTM 390 Duke by Mr. Rajiv Bajaj, MD Bajaj Auto Ltd. and Mr. Stefan Pierer, CEO KTM Sportmotorcycles. Victories in racing comes naturally to KTM, known across the world as a racing powerhouse with more than 240 World Championship titles. Launched less than 2 years ago in India KTM is already the ‘No.1 Premium Motorcycle Brand’ in the country with an extensive network of 100 exclusive dealerships in the country.